Sometimes, as a traveller, it’s hard not to look forward to your next destination. I suppose it is the case with anything in life, when you are on the brink of something special, it is easy to forget to live in the moment. The problem, however, is when everything is amazing and there is always something to look forward to. Throughout Europe, I often caught myself dreaming of Africa, drifting away to my next great challenge, and unfortunately quite often I really had to force myself to see the beauty of where I was. However, as I sit here today in Morocco, I’m not thinking about anything else, I am not looking forward to anywhere else, I am back in the moment. I am having a hard time wiping the smile from my face as I occasionally burst into a short giggle in the realization that “I’m in Morocco”. But it’s more than just the location. There is something that I’ve been missing for a while: that foreign feeling. It’s the reason I left South America, and it’s the reason I chose Africa as the next leg of my adventure. I just wanted the world to feel strange to me again. I wanted to feel like a child discovering a new playground. 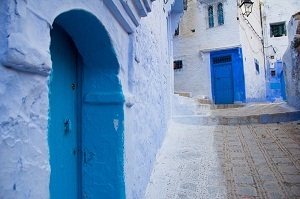 As my feet scamper through the blue lined alleyways of Chefchaouen I feel as if I am a guest in an alien world. On the streets, men walk silently in ewok garb, woman giggle at the strange sight of my western face, and children try to pet at my blond arm hair as they pass. Love the Berber robes. Don’t they remind you of the outfits the Ewoks wore in Star Wars? I work my way through a maze of blue-coloured streets, a colour-reminder of the Jewish heritage of this Moroccan mountain town. “La, Shukran!” I say, politely yet forcefully declining the services of people offering hotels, tours and most of all hash. I don’t mind the hassles, my life has almost been too easy over the past couple months. Rail journeys, boutique hostels and street side French cafes certainly have their place in the world but I had been craving a challenge. I had been craving this feeling. I had been craving stress, excitement, and new challenges. Everything in Chefchaouen is blue… everything. It’s hard not to feel more alive than usual as the Moroccan street scenes attack your senses from all angles. The smell of spices tickle the hairs of my nose as a fresh dish is served in the square while the poetic call for prayer rings out through the medina. I search for some tranquility for a moment, as I do each day in the early afternoon and hike to what looks like a viewpoint above the city. I walk past a soccer pitch, a couple minarets, and the usual guides and hash salesmen. Finally, I take a seat on a cement perch away from the crowds and sense only peace this time. I look down on the blue city of Chefchaouen in awe and think to myself that for the first time in a while, this is exactly where I’m meant to be. How is that for a view of Chefchaouen? Previous ArticleHow Much Does a Eurail Pass Save You? Chefchaouen is a great place to visit and I agree with you. It feels dramatically different from Europe. Wait until you see Fez! Will – Isn’t it amazing how you can go just a couple hours via boat and road from Spain and be in a completely different world? Great post! I was in Morocco a few summers ago and took a day trip to Chefchaouen. It really is a beautiful city. When I describe it to people I always say it looks as if someone melted a giant pot of blue marshmallows and poured it over the city. And it’s funny that you mention Star Wars… Our tour guide was Yoda in human form. He couldn’t have been taller than 4’10”, he was wearing a little green hat and his voice was very Yoda-esque. Of course, he was incredibly wise as well. It was amazing. Thanks for sharing; I really enjoyed this post. It makes me want to go back to Chefchaouen! Lauren – That’s a great way of describing Chefchaouen. I love it! Looks like something straight out of Star Wars mate. Hopefully be seeing this soon myself. I love the feeling of being surrounded by all things foreign. 🙂 Looks like you found your element in Chefchaouen. And I agree with you, the robes and the landscape look straight out of Star Wars. Audrey – I couldn’t help but giggle when I saw the outfits the first time. I thought of Yoda right away. So…about sending interns to Africa with you…. Soon Jackie… First we build the magazine to an epic readership, then you guys get fun road jobs… soooo get back to work haha. I’m sat in Chefchaouen rite now. The call to prayer, the blue town, the Suzuki taxi every where and akchour gorge about 45 mins drive the other side of the mountain is an amazing sight !! Ferdinand, enjoy the town… as you already know, it’s amazing! wow!! Is there something special with the blue color? I love that man in ewok costume hihihihi! Chefchaouen ist so nice and you took some great pictures.